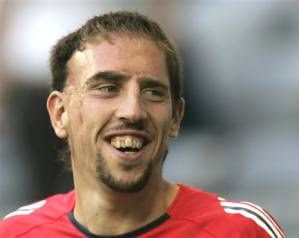 It has been reported that Manchester United are planning to sign Bayern Munich star Franck Ribery this summer, according to a report in the News of the World claiming that the English champions have joined the chase for the French international and will beat off competition from the likes of Barcelona and Inter to sign the 25-year-old. He's leaving Bayern for sure. Especially with Klinsmann doing such a poor job. United and several other big clubs have a shot at him. If he goes to United, Ronaldo should be put on the other side of midfield.